Mariola Jordá, owner of Jordá Clínica Dental dental clinic, placed Ébano Arquitectura de Interiores in charge of undertaking a project to convey a sensation of wellbeing to clients, and the studio created a project with a great sense of emotion, in which the selection of materials conveys cleanliness and warmth. This is where the solid surface from PORCELANOSA Group, KRION, in the 1100 Snow White colour, provides a sterile touch which makes it ideal for healthcare spaces. Since its establishment, Clínica Dental Jordá, located in Alcoy, Alicante, has had the clear objective of ensuring that patients feel that they are in the best hands. To do so, they have four differentiating aspects: specialisation, their team, equipment and treatments. Ébano arquitectura de interiores is a company specialised in the design and execution of architecture and interior design. On this occasion, the materials of PORCELANOSA Group – flooring, washbasins, countertops and units – have brought balance to the emotional sensation conveyed by the clinic. 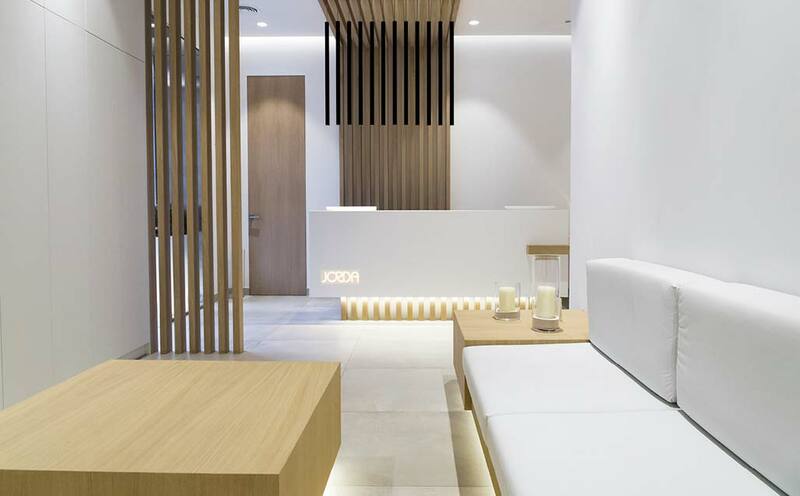 The combination of natural oiled oak and the pure white of KRION 1100 Snow White, provide the clinic with a welcoming atmosphere and a sensation of wellbeing.